How to download Bandcamp music track? EZ Video Downloader helps you to enjoy the Bandcamp music not only online but also on your PC, IOS, Android devices, for offline playback or share them the way you want as much as you want. It has more formats to choose for saving the output music. EZ Video Downloader presents the fastest and most straightforward ways to download videos, music from Bandcamp, YouTube, FaceBook, Vimeo, Twitter…providing the best quality of the videos saved from Bandcamp. Try it once, and you will agree that this is the most convenient Bandcamp video downloader you ever used! Step 1: Access the Bandcamp.com directly from your browser. Find the music you want to download in an album. Copy the URL appears on the address bar, by using some keyboard shortcuts. Press (CTRL/Command + L) for selecting URL bar & Press (CTRL/Command + C) for copying the URL. 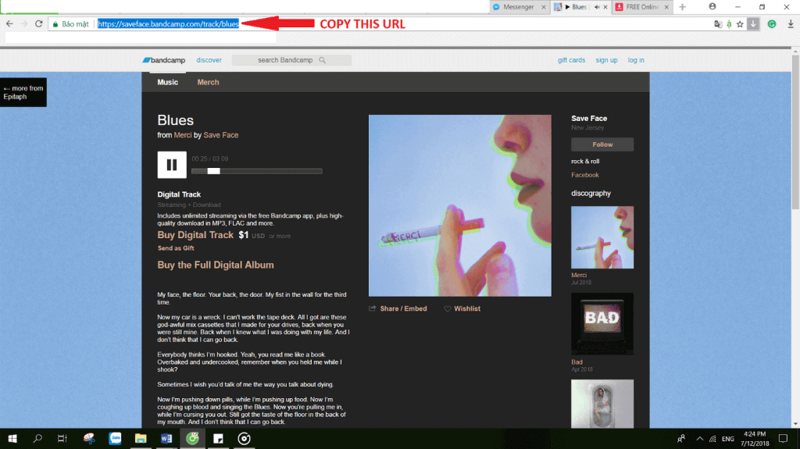 Step 2: You already have the URL from Bandcamp.com in your clipboard now. Now you need to open https://ezdlvid.com/ directly from the address bar. To be honest, you don't have to do much just paste the URL into the input field of the site, then click Download. Step 3: After pasting & clicking on the download button, you can see some available format options for the music. Select your desired quality & format click on the Download icon. No software or registration needed - in our high-performance cloud, we have fast servers which can download and convert files from Bandcamp. Now you have one single tool which can download videos or music from Bandcamp and thousands of other sites. 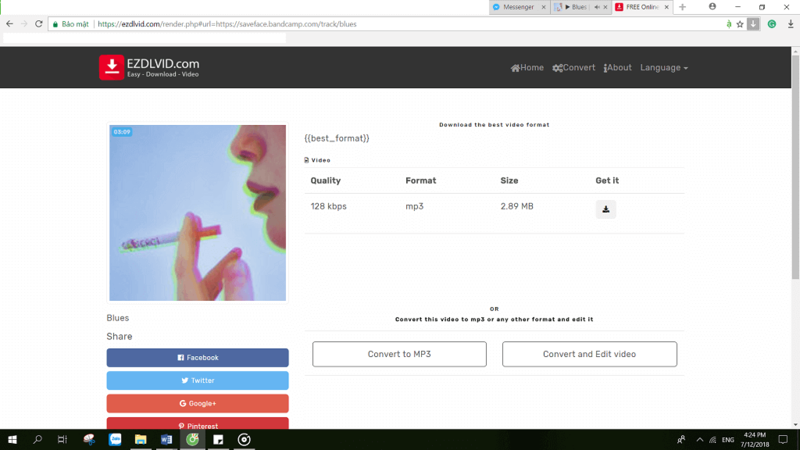 You can easily convert a video from Bandcamp to mp3 or another given format. Our EZ Video Downloader is totally free thanks to the unique solution. You don't even have to register an account or install anything! You just need to paste the link and then save the file. Have you ever wondered while listening to your favorite artists where they were discovered from? Every artist starts from the bottom, and with hard work and dedication, they get found one day by a record company and eventually gets signed. But have you ever wondered about the number of artists out there who are still working hard and waiting to get discovered? Back in the 90s, it was hard for such artists to get recognized, but today, it has become effortless for artists to share their music online and be heard by millions of people around the world. There are many different platforms online that are working hard to help newer talent, and Bandcamp happens to be one of them. Bandcamp, a web-based musical platform that focuses on getting more original and better musical talent under the spotlight, is a fascinating website and has been in operation since 2007. This site is one of the few web pages that set the right of selling songs directly to the artists. There is no intermediary or distributor. Bandcamp also charges for distribution on sale and download, but this is one of the most popular music distribution site models. You can find a lot of songs from indie to famous singers. Bandcamp does not charge a monthly fee to users. Bandcamp has become more and more popular among music enthusiasts since then. There are no restrictions on new artists to join Bandcamp. They make the music upload to the platform of Bandcamp directly. Therefore, you can discover different types of original music from Bandcamp. If you are interested in the original lyrics, you can purchase the items from its app. And then you can download music from Bandcamp in high-quality MP3 or other formats. When you do not want to buy the whole album or want to get the songs free, EZ Video Downloader should be the right solution for you.